Well, I just thought I'd pop in real quick (and I mean, REAL QUICK!) and give ya'll a little Eye Candy from The Cat's Pajamas. I'm in the midst of running around like a chicken with it's head cut off trying to do more things on my list that are humanly possible before we leave town on Saturday! The first card there is a super fun one that is actually my desktop photo on my computer right now, I love it so much!! 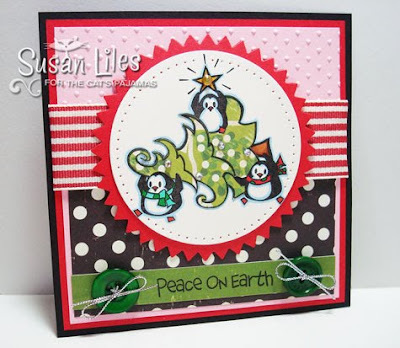 The images are from TCP's Penguin Christmas. I "challenged myself" and paper pieced the Christmas tree. It was not that hard, but the little swirls were trying their hardest to just get cut off! Next, I made this cute Christmas "Wish List" with the Give a Little set and my Slice machine for the letters. It's actually just a flat long card that you could use for it's direct purpose or attach a photo to and sign at the bottom...easy to mail too, since there's not much sticking up! I think it's one of my favorite things I've made this year. As a reminder, you don't want to miss your chance to win $25 in Cat Cash by playing in this week's TCP Tuesday challenge. It's a great sketch this week and is being hosted by Jen. Head over there to check out the details! I hope to come back tomorrow with a little Verve to throw at you and then again on Saturday with Jen's Sketch for You To Try--I'll be indulging ya'll in a little more TCP! SUSIE Q-TIP: If your "to do" list is way too long, delegate what you can. If you just can't possibly get it all done in the time frame needed, close your eyes and cross 2 or 3 things off. Magically, your list will shorten. Repeat if necessary. I love, love, love the little penguins!!! I'd have it on my screen for the holidays, too!! I hope you got all your things on your list either DONE or DELEGATED or even MAGICALLY SHORTENED!!! Have a great trip, be very careful, come back safe,sound AND exhausted!!!!! These are super cute! I love the pink mixed in with the first card.....awesome! You are leaving tomorrow? Uh oh!